The fragrance of parathas is just intoxicated but the filling matters too, in Pakistan almost any piquant vegetable, meat, mince and even lentils can be stuffed in between those two crisp flat bread, i.e. potato, cauliflower, spinach, fenugreek, raddish, chicken, and specially beef mince. 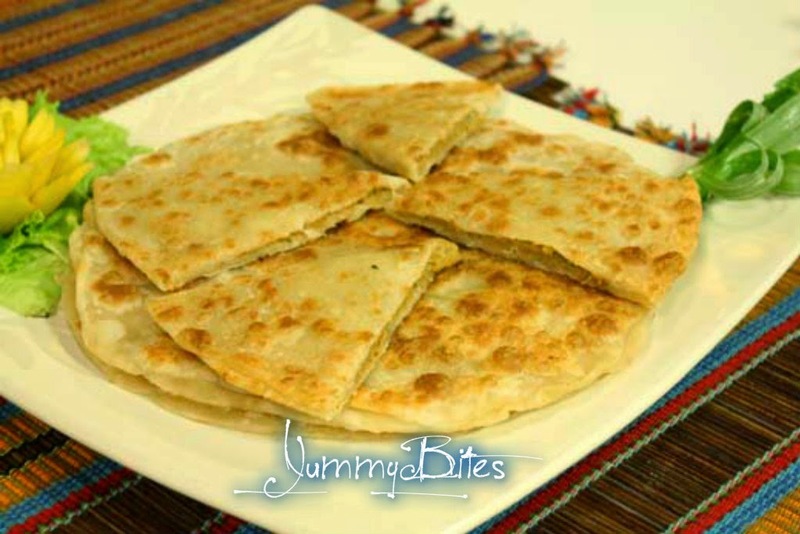 Parantha is combination of two words parat and atta which literally means layers of cooked dough. It is one of most staple food in Pakistan because it is made by pan fraying whole wheat dough on tava like simple roti or chapatti. Paratha dough usually contain ghee or butter with a pinch of salt and sometime milk is added to make paratha more softer and richer taste. Stuffed parathas are normally eaten simply with a pat of butter spread on top, with chutney, pickles, and yogurt, or some roll the parantha into a tube and eat it. You can spice up the stuffing any way you want, some like to add garam masala, others add chaat masala and some sauté the onions with the spices until they are cooked, before mixing it into the vegetables or meat. 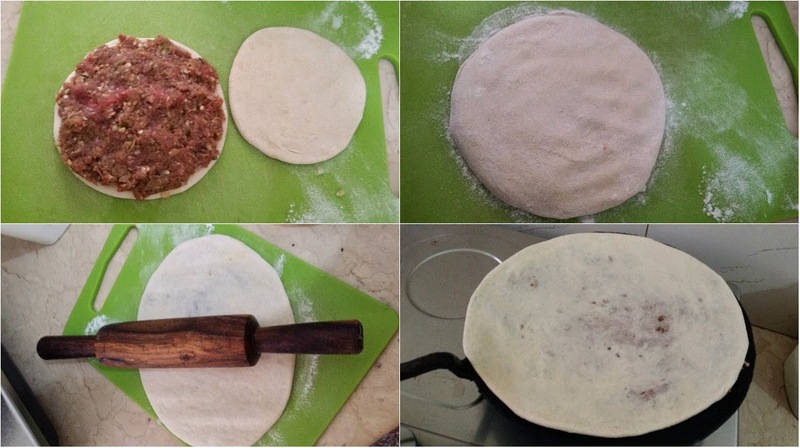 Beef mince paratha aka Qeema bhara paratha is one of the most palatable and scrummy paratha and is favorite among Pakistanis. Usually people wash the mince under running tab water to clean it, add some spices and precook it before stuffing in parathas. And then they surmise that paratha lacks the taste of meat and seems stuffed with salt and papper only. But they don't notice; while washing the mince all the juices, natural moisture and taste is washing away too and because of precooking the taste has be evaporated into air rather then the parathas. In my family, mince is never washed before cooking; for people its unhygienic; but its not. (One must wash the meat before grinding or throwing it to mince machine) When the spices are added to fresh mince they mix with the natural juices and the moisture is absorbed as steam by the flatbread while cooking paratha. I have used beef mince with onion, chillies, coriander, ginger, garlic and some basic spices; stuffed in flat bread made of plain floor; cooked and then fried in cooking oil on a heavy base flat pan aka tava. Cut the onion and ginger in large chunks, grind them with green chillies, cumin and coriander seeds. Don't grinder to much otherwise onion will release it water content and it will make the mince watery causing it to be difficult to stuff. Add salt and pepper powder to the mince. Mix well the grinned onion with mince. Make floor dough balls and with rolling pin make 2 flat bread of 5" diameter. Place handful of mince mixture on one flat layer put the other layer of dough on top of it. Seal the extremity of the bread layers by pressing with thumb firmly. Roll the rolling pin softly over it and make it more larger and thiner. Carefully put the rolled paratha on heated pan and cook it on both sides on medium heat, then drop a oil from the side of the paratha under it and fry until golden and crisp. Good post. Have you found Meat Mincing Machine ideal?